That’s what I’ve been hearing alot lately. So, guess where I”ve been??? Working! It’s true — after 12 years home with my kids, I’ve gone back to work. And, I’ve been trying to ‘walk the walk’ not just ‘big talk’ about how to feed a family (at home not in the drive-thru) while working. The goal was to share this struggle, but honestly, I’ve been way too busy. I started a part-time job programming and doing data conversion and new customer training at a start-up software company called AppealTrack. It’s founder is a long time friend of mine who I originally met while interning during college. I’m not sure I would’ve applied for this job had I seen it as a random job opening — it would’ve seemed beyond my comfort zone in terms of work experience — but the training has been outstanding and the experience has been awesome. I’m truly loving it! And, more importantly, it’s extremely flexible — which has been exactly what the family needed as I transitioned back to work. Honestly, the family nearly starved during my first three weeks working. We don’t eat out – we just don’t. So that wasn’t a fall back for us. So, when mom doesn’t get to the grocery and she doesn’t meal plan — we all just wander around like crazy, hungry people and eat whatever we can throw together. (These results did not get us Great Purge caliber dinners – to say the least). But, now, after three months, I’m in a routine. We do eat out once a week now, but I am in a regular meal planning and grocery shopping pattern. It’s not what it used to be, but it’s working for now. And, finally, a teaser….. As we all know, The Great Purge Vol 3 looms just around the corner. So be assured that I’m not stock piling the pantry. In fact, my prediction is that based on the past couple of months, this purge will last a much shorter time than previous years. But, you never know — that pantry is the size of a closet, literally! Here’s what I’ve learned: I can still do this. It takes more coordination, more energy and especially more help from the family (which they have stepped right up to give). I hope you continue the journey with me! You’d think I hadn’t shopped in a month – not a week. Aldi on E Washington Street (8 Bus – IndyGo) and Walmart on Emerson Ave (16 Bus – IndyGo). My purchase at Aldi totaled of $130.79. That means that $124.31 was eligible. At Walmart, I spent $155.45 with $68.94 being groceries that are SNAP eligible. So, my total SNAP spending was $193.25. This only works for me because I have made a conscious effort to meal plan, read labels and try not to pass along my chocolate cravings to my kids (so far – not working). 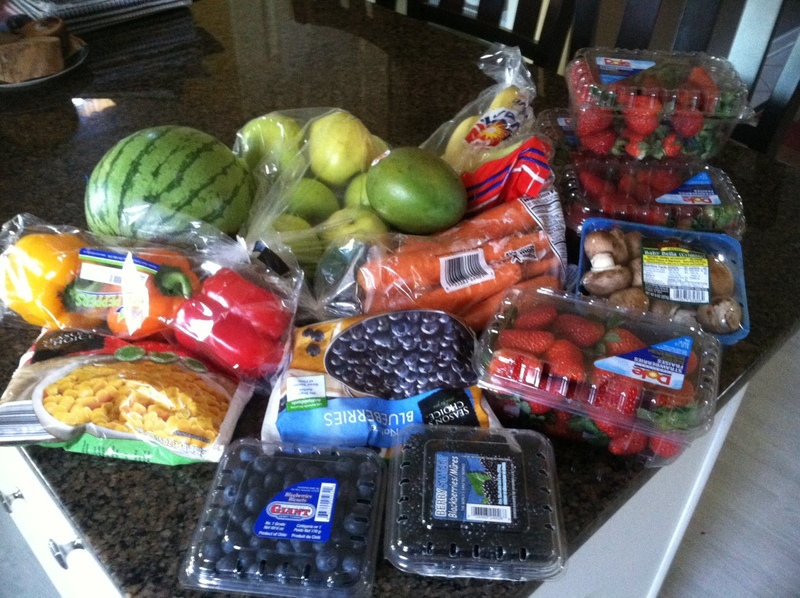 I purchased 8 fruits and vegetables and 13 protein items that could be used as the main dish in meals. And as you all have seen, we are a snacking family too – so there are plenty of cookies, granola bars, chips, etc in there too. Help me to help others learn to meal plan, eat healthier and use their SNAP benefits wisely. I left you hanging for quite awhile I realized – so two quick ‘By The Numbers’ posts in a row. Today I grocery shopped. I spent $83.82. That’s 14 varieties. I would estimate that it is almost 70 servings of fruits and veggies. It should last us a week. Per serving that amounts to $.36 – that’s CRAZY TALK! That’s cheaper than a candy bar at the concession stand – no WAY!